A colour photograph of the east side of the Miniature Village at Cullen Gardens. In this view the white clapboard church can be seen to the right of the photograph. 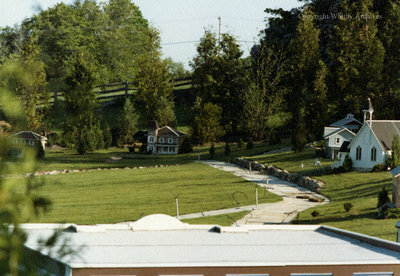 The models in the Miniature Village were exact replicas built on a 1/12 scale. They included houses, churches, schools and shops modeled to represent a typical small town in Ontario. Miniature Village At Cullen Gardens, Date Unknown, Photographer Unknown. Whitby Archives A2013_042_264.